Now that you’ve bought that amazing new DSLR, you need a book that goes beyond the camera manual to capture stunning images. For photographers interested in landscape photography, this guide will help you conquer the fundamentals and take amazing outdoor shots. Pro photographer Rob Sheppard starts with the basics–composition, light, and perspective–and describes how to connect with your scene. He covers all the key camera features that affect your image, including how changing focal lengths alters your perspective and the aperture’s direct correlation with depth of field. Once you’ve captured those shots, Rob takes you through simple post-processing steps in Lightroom, Photoshop, and Photoshop Elements. This guide is for beginning-to-intermediate digital photographers to understand the basics and bring their own unique artistic expression to landscapes and outdoor shooting. Beautifully illustrated with large and compelling photos, this book teaches you how to take control of your photography to get the image you want every time you pick up the camera. 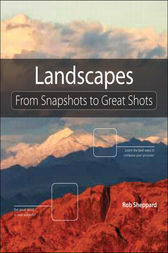 Rob Sheppard is also the author/photographer of over thirty photo books, including The Magic of Digital Landscape Photography, The National Geographic Field Guide to Photography - Digital, and Adobe Photoshop Lightroom for Digital Photographers Only. He was the editor of Outdoor Photographer magazine for 12 years and was the original editor of PCPhoto (now Digital Photo). He still writes regularly for Outdoor Photographer and teaches popular workshops around the country. See his work and photo tips at robshepppardphoto.com, and his blog at natureandphotography.com.